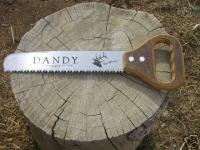 I've had the 12" Dandy saw for years now. I love that thing! It is tough as nails and cuts wood and bone very well. Best hunting/camping saw out there! Bought this saw for wilderness camping. It is a wonderful tool and not very heavy. The blade does not bind when cutting logs as thick as eight inches. I cut through a six in dead cedar log in no time at all. Is a joy to use. 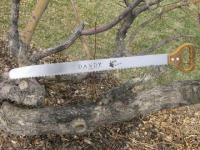 Forget the saws where the blade slides back in it's handle. These saws are only good for cutting limbs no more than two inches thick. If you want a nice fire with little effort buy this saw! I have used this saw for years. I have never had to replace the handle or blade. As stated it is a hardworking saw. I use it on pack trips into the back country where broken equipment is unacceptable. I never go without this saw. The handle is comfortable to use and it cuts great. I love the wooden handle. It feels good in the hand. Very useful for heavy duty camping. 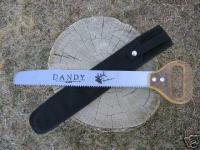 A very handy dandy saw. Perfect for my search and rescue pack. Love this saw! I carry it in a saddle scabbard when I'm trail riding and it's easy to use.